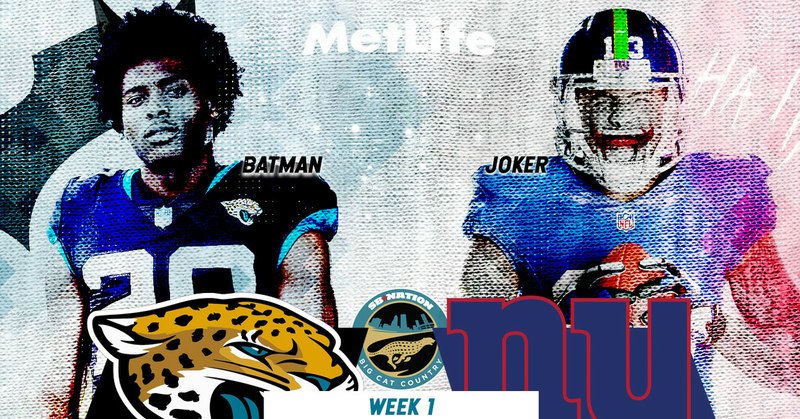 The Jacksonville Jaguars will be in a Duval state of mind despite making the trek to the Big Apple to take on the New York Giants this Sunday at 1:00pm EST. IMPORTANT UNIFORM WATCH: White tops and white trousers for the good guys. To see a full series breakdown between the two squads, click here. Coming off of a 3-13 campaign, the New York Giants will be looking to flip the script on their 2017 record and make a strong push for a playoff spot in their division. There are some new faces on the Giants roster this year, but none more important than new head coach Pat Shurmur. A cunning offensive-minded head coach who employs a less-is-more approach, Eli Manning and the Giants should benefit from Shurmur’s playbook that will feature rookie top five pick Saquon Barkley. A threat to take it to the house on any touch, Barkley will be the centerpiece of the Giants offensive strategy and will need to be extinguished immediately before hitting the open field. Two key playmakers on both sides of the ball have been hampered by injuries this week for the Giants. Tight end Evan Engram was removed from concussion protocol on Wednesday after taking a nasty helmet hit in the preseason and should be good to go for Sunday. On the defense, Olivier Vernon is dealing with a high ankle sprain that required him to be carted off from practice on August 26th, and when asked about it this week, Shurmur was coy with reporters, stating that Vernon is a “quick healer” despite not practicing all week. Even if Vernon does end up being active on Sunday, he will be extremely limited and not the same player, likely losing some snaps to rookie Lorenzo Carter. Looking at the Giants depth chart, they have weaknesses along the offensive line and free safety/nickel cornerback on defense. The Giants spent resources both financially in left tackle Nate Solder and through the draft in left guard Will Hernandez, but the entire right side looks like a sieve and the unit as a whole is still trying to develop some cohesion. This should be a game where Sacksonville feasts in the backfield, but as mentioned above, will need to be careful not sending extra pressure on the blitz and getting scorched by Barkley on the screen. On offense, Nate Hackett is going to have to rely on tight end Austin Seferian-Jenkins and whichever receiver(s) line up in the slot to attack the middle of the field, where newly acquired inside linebacker Alec Ogletree has struggled in pass coverage. It’s Week 1, so there is a sundry of storylines to focus on. Make no mistake about it, though — this game is all about one man. The football czar will have his first opportunity to square off against the team that unceremoniously kicked him to the curb after bringing them two Lombardi trophies. This is the same team that ruined Eli Manning’s starting streak to give snaps to a rookie third rounder who isn’t even on the roster anymore. If you don’t think Coughlin hasn’t been scheming, prepping and divulging trade secrets about the franchise that parted from him like a bad Ben McAdoo haircut, you’re crazy. For months, it’s probably the first thing he’s thought about waking up and the last thing that entered his consciousness before resting his beautiful, brilliant head on the pillow at night. The NFL knew exactly what it was doing by scheduling this game for Week 1, and we are all extremely here for it. Not only the most anticipated match up of this game, but potentially the must-see TV battle of the elites in the entire NFL this week. Jalen Ramsey is a brand of astronomical proportions the likes of which this franchise has never seen, and a week one clash with his character foil on the offensive side is something football fans just aren’t worthy of. With that being said, people forget that the Joker has been locked up in Arkham with a serious ankle injury and hasn’t taken an NFL hit in close to a calendar year, so Ramsey should have the edge. If this game was played later in the season, it would truly be a treat. Cane on Cane crime coming up this Sunday. Calais Campbell had a monster week one last year with four sacks against the Texans, but can the towering lineman eclipse that mark this week against the sluggish Flowers? Don’t bet on it. Shurmur is smart and will likely give Flowers some extra help on the right side with Rhett Ellison as an extra blocker to pick up the rush. With extra assets designated to that side, it will be up to Yannick Ngakoue to prove he’s as good as we all think he is and show that the Giants over-paid Solder. Before you get all excited about Olivier Vernon being out, pump the brakes. No doubt Vernon is the better overall pass rusher, but Carter is a twitchier freak athlete in the mold of Danielle Hunter. Remember how that matchup went in week two of the preseason for Cam? Carter is still raw and Jaguars fans shouldn’t be overly concerned about a rookie making his debut getting a handful of sacks, but Cam has shown he has struggled with speed and bend, which is what Carter’s game is comprised of. With Evan Engram being cleared from concussion protocol, expect the Giants to feature him in the slot this week. To counter a dangerous move tight end like Engram, the Jaguars need to unleash the “brute back” in Ronnie Harrison to neutralize the size advantage that Engram has. I expect one big hit from Harrison early on to make sure Engram thinks twice about coming over the middle of the field so fresh off of a bone-jarring recent helmet to helmet hit. I’m not as worried about a rusty Odell Beckham Jr. as I am about Saquon Barkley tearing the Jaguars up in the passing game. As mentioned above, look for the Giants to mitigate the Jaguars pass rush by quick dump off passes and screens. If one player misses an open field tackle on Barkley, it could spell trouble for the Jags. If the Jaguars are going to win this game, they need to be aggressive out of the gate and have the offense give them a lead quickly. The quicker that the Giants have to abandon Saquon Barkley and the running/screen game, the sooner the defensive line can pin their ears back and attack knowing it’s going to be a pass play against a porous offensive line. I say the Jaguars go play action early and take some deep shots without a true free safety to worry about; something they haven’t really shown this preseason. If they put early points on the board, this game has a chance of becoming a route.